Restored 1947 Indian Chief Motorcycle. 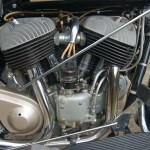 The engine was completely rebuilt with new pistons, rings and roller bearings. New intake and exhaust valves, springs, keepers and roller rocker arms were installed. The oil pump was overhauled with new gears. 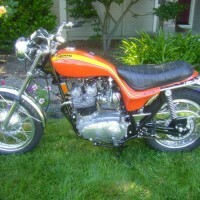 The primary chain was replaced and the chain cover and front brake plate were polished. The transmission was completely overhauled with all new bearings, gears, idler shaft and output sprocket. The cluster gear and sprocket gear was replaced. 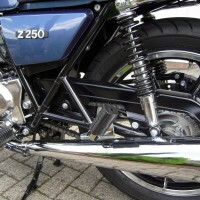 A complete new exhaust was fitted. The kick starter arm was replaced. A new drive chain and sprockets were fitted. 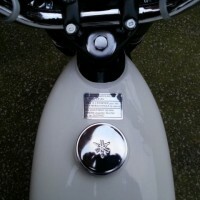 The electrical system was overhauled and fitted with a new ignition switch and ammeter. 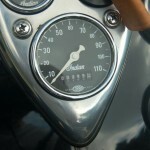 A rare deluxe speedometer with working tripometer was installed. A new headlight, spotlights, rear tail light and complete wiring harness, including all connecting wires was fitted. 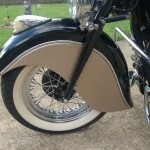 Front and rear fender tips. 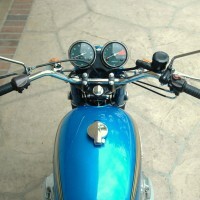 New handlebars, spotlight bar, windshield bar, headlight bars, and rear fender bars were installed. The wheels were completely overhauled, new chrome rims were laced with stainless steel spokes and new wheel hubs. 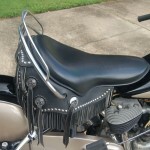 The buddy seat was completely overhauled in black leather with fringe. 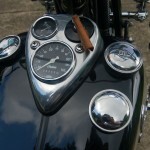 A new chrome seat rail was installed. All of the bolts, nuts, screws were replaced with polished stainless steel, nothing was left untouched. 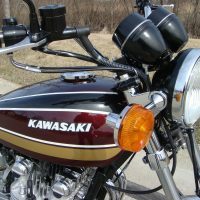 A black/champagne two tone professional paint job finished this numbers matching Motorcycle. A stunning restored Indian Chief Motorcycle. 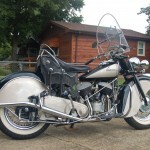 Indian Chief – 1947 For Sale or Wanted? If you're looking for the perfect Indian Chief – 1947 for sale then take a look at the hundreds of restored classic motorcycles listed on our extensive Motorcycles For Sale pages. 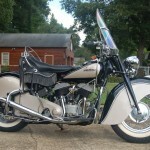 We regularly feature very nice restored Indian Chief – 1947 bikes for sale. 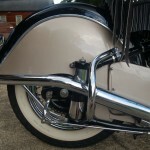 Spares and Parts for your Indian Chief – 1947? 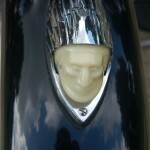 Workshop Manual for your Indian Chief – 1947?